We all are eagerly waiting for the Xiaomi Mi6, and the device is going official on April 19th. But, seems like the leaks are all set to spill the beans. 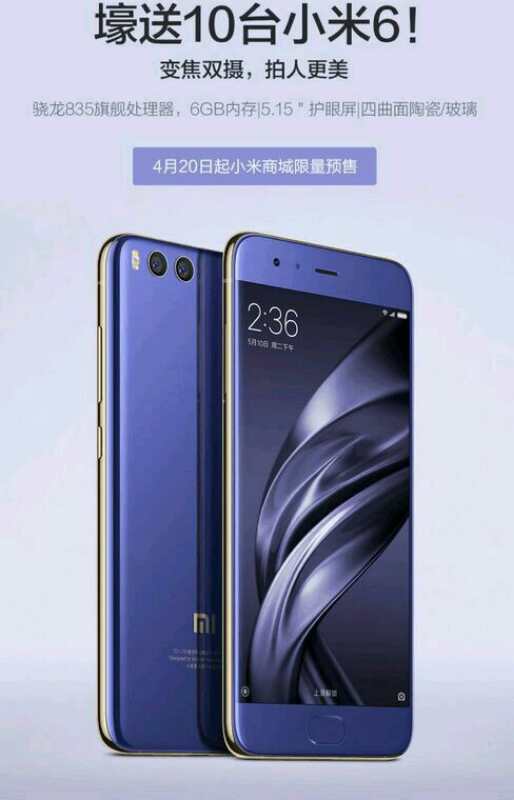 Today, we have got the press render of Mi6 in a beautiful Purple color that looks stunning with that glass back. Now, along with the render, the details about the processor as well as the RAM size have also been leaked. Starting off with the processor, the image above clearly mentions that the phone features Snapdragon 835 chipset that we have already seen on the Galaxy S8 which is, in fact, the first phone to come with this chip. Also, the Mi6 comes with 6GB RAM on board, and probably there’s gonna be a 4GB variant also. The phone features a 5.1.5-inch Quad -HD display and a dual camera setup on the back. There is not going to be any bezel-less stuff on the phone, but it features negligible bezels on the sides. Along with this, the phone has an oval-shaped fingerprint scanner on the front that is slightly bigger in size than the normal. The volume buttons are on the right side along with the power button, and there is the SIM card tray on left side, which will be a hybrid slot for sure. Well, that’s all the press render of Xiaomi Mi6 reveals. What are your views about the phone? Do let us know via the comments section.